I have been driving around my 2001 Chevy Cavalier ever since I was 15. Its golden color makes it shockingly ugly to the eye but my old “clunker" has faithfully served me well over the past couple years. However, it would not survive in the sandbox arena of REKT! ($1.99). REKT! is an arcade stunt driving game where you traverse an open course in a variety of different vehicles, all while performing various stunts and maneuvers. The entire purpose of REKT! is to perform as many stunts as you can in a limited amount of time. There are a few time pick-ups that you can acquire throughout the environment to extend your overall time. Each stunt is worth a certain score and you can add bonus multipliers to your overall score by stringing multiple stunts/tricks together in rapid succession. You can compare your end-score you recieve from each run to other players through leaderboards. Also, the higher score you obtain, the more cars you will unlock. Each car drives a bit differently from the next and it was fun to experiment with each one individually. It kept the gameplay feeling fresh. 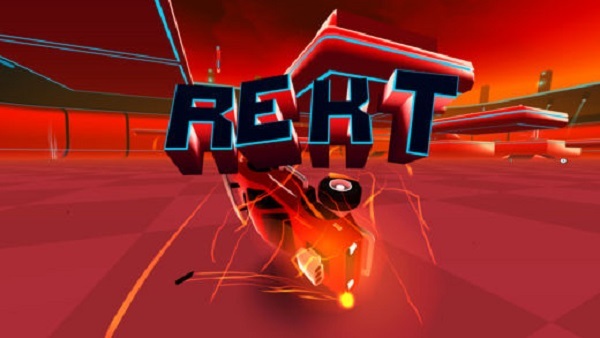 There are numerous challenges to complete during each run within REKT!’s sandbox arena. 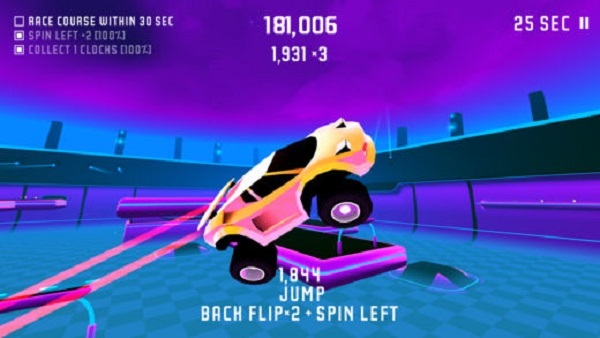 These challenges include doing a certain number of flips, spins, and drifts on specific obstacles throughout the arena. I appreciated the variety of challenges I encountered throughout my playthrough of the game. It gave me specific goals that caused me to repeatedly experience a “one more time" phenomena of trial and error whenever I didn’t complete a challenge. You also receive a certain amount of REKT (REKT!’s form of currency) for each challenge you complete. Once you save up enough, you can spend it on a spin wheel for a chance to unlock new cars and cosmetics. These challenges would be an absolute chore if it weren’t for REKT!’s tremendously simple and smooth controls. Your cars automatically accelerate as you steer them left and right by pressing on the left and right sides of the screen. Swiping your fingers across the screen in different directions will cause your car to flip and spin. Tapping and holding the screen mid-flip or mid-spin stops your car’s rotation. You can also hit the brakes and reverse your car by pressing the bottom-middle of your screen. However, it was awfully awkward to break or reverse on my iPad because of the need to reach across the larger screen to tap the correct area. All in all, I loved how there were no buttons convoluting the screen. It allowed me to completely focus on the gameplay of REKT! instead of its controls. There is only one sandbox arena in REKT!. Its layout is well-crafted and consists of many ramps, loops, platforms, and destructible obstacles that inspire creativity and exploration. However, I wish there were more arenas to burn rubber in. After a while I found myself getting bored of driving around the same environment for so long. According to the game’s developers, new arenas and cars will be added to the game in future updates. I also wish that there was a free-roaming /practice mode in the game where you could mess around as long as you desired, instead of only offering the fixed time constraints of the game-mode that is currently available. It’s important to note that I experienced a few glitches in REKT!. On a few occasions, my car wouldn’t drive into the arena at the start of a run. My car also got stuck on the edge of 2 ramps. Both events happened rarely but they happened nonetheless. Fortunately, REKT! hosts vibrant, psychedelic colors and aesthetics while maintaining a solid 60 fps during gameplay. The game’s music was catchy and complemented its visuals well, but I found it to be a bit too repetitive after a while. I ended up listening to my own tunes after an hour or so of hearing the game’s music. Despite these minuscule glitches and gripes, I really enjoyed recklessly driving around REKT!’s eye-catching sandbox arena. Landing complicated stunts and achieving higher scores (all while unlocking cars and cosmetics) kept the game feeling fresh and satisfying. Its controls were a pleasure to utilize and I never felt that I was being cheated out of a high score by the game itself. Every mistake felt like it was solely my own. My biggest complaint with the game is the lack of another arena or game-mode. However, isn’t that a fantastic complaint to have? For 2 bucks, you can’t go wrong with snagging it. If you’re still on the fence, check out other people’s impressions of REKT! in the game’s forum thread and feel free to leave impressions of your own!